PHANIDHAR BORDOLOI MEMORIAL TRUST (PBMT). 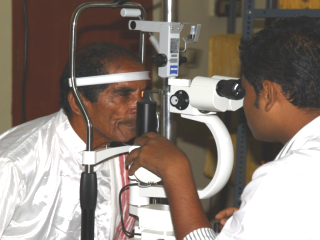 The community ophthalmology in CPEH is managed by PHANIDHAR BORDOLOI MEMORIAL TRUST (PBMT). Phanidhar Bordoloi Memorial Trust was established in 2006 with an aim to treat poor patients of their eye illnesses free of cost. This trust is attached to Chandraprabha Eye Hospital of Jorhat which a tertiary eye care centre famous for its quality eye care services all throughout North East India. The Managing Director of CPEH decided to form the PBMT in order to facilitate the poor patients to the high quality service CPEH offers. When the trust fund was developed it was used to treat 10% of the total patients to treat free of cost. The free treatment includes consultation, investigations, medical and surgical treatment. 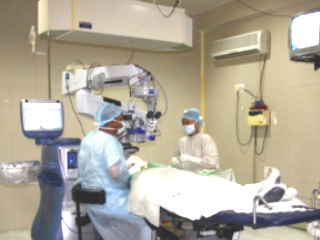 The surgical treatment encompasses all eye surgeries i.e. cataract, VR, glaucoma, culoplasty etc. The medical treatment includes all forms of laser treatment the hospital offers. PBMT has a spacious, independent, adjacent building, which has 30 beds fully dedicated to the free patients. The free patients are examined comprehensively in the new premise as done to the payee patients. For advanced investigations like Ultra sonography, Angiography, Field testing, OCT etc they are brought to the main building. 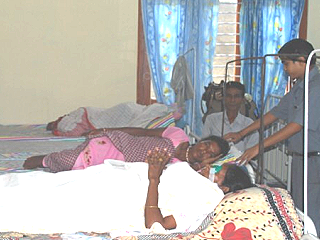 Similarly those patients who need surgery are brought to Operation Rooms in the main building.